Stars Draft Recap: Who is Valeri Nichushkin? For the second time in five years, the Dallas Stars were set to make yet another top ten selection in the NHL Entry Draft. Since taking Scott Glennie #8th overall in 2009 (oops), the Stars recent first-round picks have a combined total of two career NHL points in that time frame. Digging deeper, no first-round pick by Dallas since 2005 has yet to appear in more than 16 career NHL games (Matt Niskanen). To be fair, given a few questionable selections along the way, former general manager Joe Nieuwendyk has still set this team up for an exciting new chapter of hockey in Dallas. 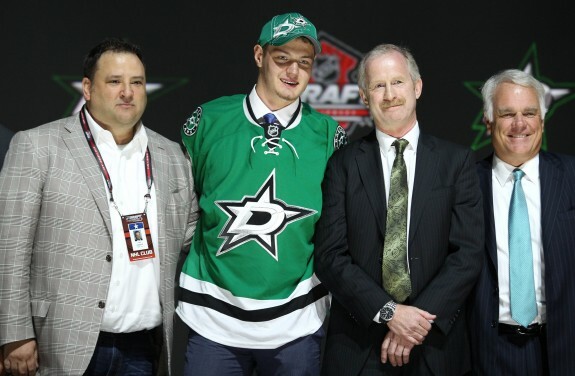 While it will take some time for more recent first-round selections such as Radek Faksa, Jamie Oleksiak, and Jack Campbell to develop into the NHL’ers they’re very well capable of being – there’s no doubt they’ve acquired elite talent with all three, in due time. Despite heavy speculation throughout, newly hired general manager Jim Nill vowed to hold on to all nine selections in this years draft. While many thought the Stars would be heavily pursuing defenseman and Frisco native Seth Jones, the cost appeared entirely too high for their liking, and decided to hold on to the number 10 selection. After missing the playoffs for five straight seasons and entering a Central Division with the defending Stanley Cup Champion Chicago Blackhawks, the Stars are more pressured than ever to put the best possible product on the ice come October’s opening night. He’s a highly coveted power-forward with magnificent hands and NHL-ready size. At 6-4 and weighing in over 200 pounds, he excels in playing a solid North-South type of game and knows how to use his body to gain leverage along the boards with the puck. He’s a left-handed right winger with tremendous hockey IQ. He’s been compared to have a similar playing style and effortless playmaking ability to Evgeni Malkin, Rick Nash and Alexander Ovechkin by numerous of sources within. Nichushkin was considered a highly sought out prospect after the 2013 World Junior Championships. Scoring the game-winning goal against Canada to notch the bronze medal for Russia, his performance throughout the tournament immediately marked him to be a potential top-10 target for many NHL teams come June’s NHL Entry Draft. Since representing Russia on the national stage with Traktor Chelyabinsk’s U-18 team, he would then make his KHL (Kontinental Hockey League) debut at the age of 17. The KHL is arguably the second best hockey league in the entire world. Given his age, it’s a fairly remarkable achievement to have appeared and contributed in such a prestiges level of play as early into his career as he did. Appearing in 18 games, Nichushkin went on to record six points (four goals, two assists) and a plus-6 overall rating in 2013. Nichushkin, 18, has the potential to be a true superstar in this league and in a very short period of time. Joining fellow countryman Sergei Gonchar, he’s bound to have an excellent mentor as he begins his NHL career as a Dallas Star. I believe he was brought to Dallas to form a new identity on the ice and join what’s already an intriguing set of young forwards. Nichushkin made it clear he did not want to play in the AHL this season. Per Dallas Morning News correspondent Mike Heika, Jim Nill has reported to have informed Nichushkin that he will indeed be in Dallas vying for significant NHL playing time and not in Austin with the Texas Stars (AHL) under any circumstances. Under that agreement, Nichushkin will now opt out of his deal with the KHL and will be joining the team to attend the Stars Rookie Development Camp on July 4th in Frisco, TX. The Stars also selected F Jason Dickinson in the first-round #29th overall (from Boston). Dickinson entered the 2013 Draft as one of the most intriguing, yet, unpredictable players in the entire class. Despite being labeled as “inconsistent”, or “a shot in the dark” by many scouting analyst, he appeared to show strong signs of pure NHL upside to his game last season playing for Guelph in the Ontario Hockey League. Dickinson’s most known for his impressive agility and creativity with the puck. While having above-average offensive instincts, many believe his defensive and physical game could be what makes him an elite NHL player in years to come. Appearing in 66 games for Guelph in 2013, he saw himself become a consistent power-play contributor and excelled tremendously on the penalty-kill. Recording 47 points (18 goals, 29 assists), he went on to lead the team with a plus-19 overall rating before getting selected to Canada’s U-18 World Championship Team. Remaining apart of the top-30 to be selected in the majority of mock drafts come early-June, Dickinson showcases poise and quick decision making with the puck that will land him in the NHL within the next few seasons. While still considered a very “raw” player, he has tremendous upside in Dallas where defense is what needs to come first. 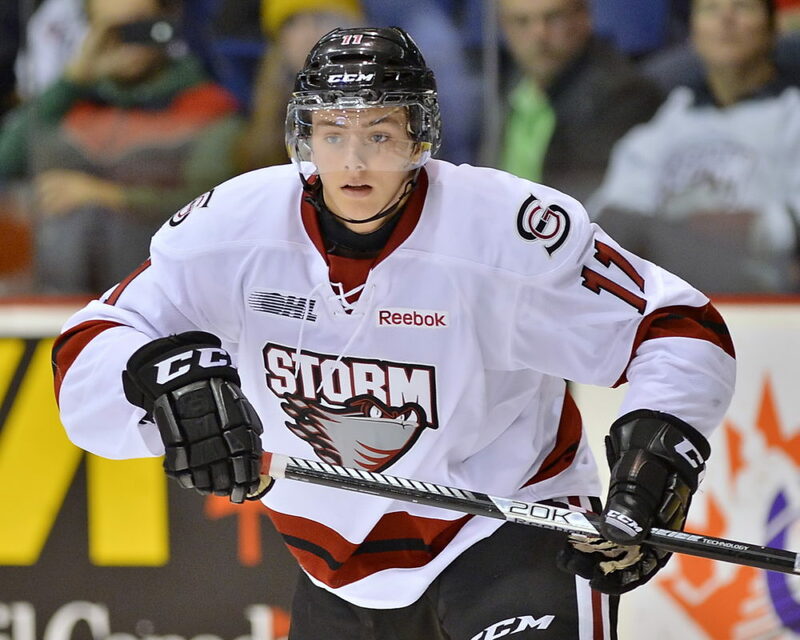 He resembles a very “Loui Eriksson type” game, but with a far more physical presence. Dickinson will also be in Dallas in time for the Stars Rookie Development Camp.